The last few years of the Internet world have proved memes are one of the great ways to entertain people in their bad hours. We heard many success stories from picture sharing websites that host memes type content on their servers. 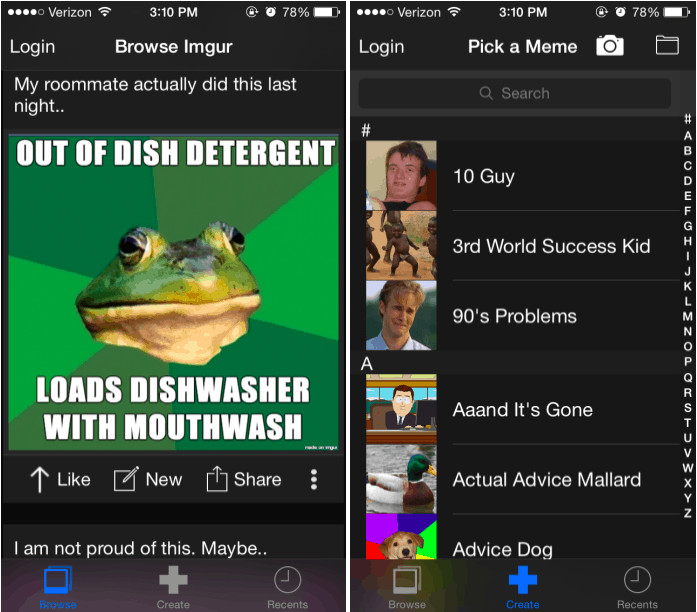 There is a huge network of websites that host memes, but Imgur appears to be the first ever service climbing on iOS with a meme generator in their official application. Imgur introduced MemGen tool on iOS via a new application release in the App Store. The new application from Imgur allows iPhone and iPad users to create meme images easily on their devices, and share it with other users. MemGen is available in the App Store, and Imgur has recently started promoting it around the Internet. MemGen app for iOS features three tabs under its belt, which allow users to Create, Browse, and view recent images of you available on Imgur service. The application is pretty straightforward, and handy for the meme fans who love to generate memes over the time. Browse: The browse tab allows you to check out what is happening in the meme world, and as well as let you sort out the popular images. Create: It is the real function of the application as it allows you to create new meme photos on your iOS device. Recent: The recent tab shows all your recently created meme photos, which is a great option to keep your creative work at your fingertips. Using MemGen on your iPhone, you can import any picture from your Photo Library and start creating your own meme right from your iPhone. It is available for free of cost in the App Store.